The Toronto Sun, a sensationalist tabloid-style Islamophobic newspaper, is at it again. 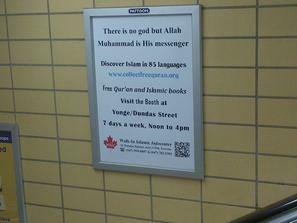 This time it has taken the trouble to report the (non)story of Islamic ads at subway train stations in the Toronto area. The ads in question state “There is no god but Allah” and gives further information about the “Walk-In Islamic Infocenter” which offers free translations of the Qur’an in over 85 languages. The story, which may have been fed to the Sun by Arnie Lemaire (a.k.a. “blazingcatfur”), was predictably covered on anti-Islam blog sites and on “The Agenda” tv show hosted by Michael Coren, a news commentator who has recently been importing British-style tabloid Islamophobia into Canada via his new employer, Sun Media. The title of this particular segment of his tv show was the provocative “Allah rides the TTC”. 1. The statement “There is no god but Allah” is offensive to non-Muslims and counts as aggressive proselytizing in public space. 2. Muslims are being given special rights that non-Muslims, such as Christians, do not enjoy. Had a Christian put up such an advertisement on a bus or subway train, Muslims and the PC brigade would have been up in arms. The Toronto Transit Commission (TTC), the public transport agency that operates public buses and subway trains in the Toronto area, in other words, is scared of jihadist fatwas. This story, after it was first reported by the Sun, was also unfortunately taken up by The Toronto Star and some other mainstream papers, albeit minus the melodramatic anti-Muslim polemics. The TTC’s Advertising Commission along with TTC commissioner Maria Augimeri and TTC chair Karen Stintz reviewed the ads and found that there are no legal grounds to remove them. The Supreme Court of Canada in a past statement has said, “Citizens, including bus riders, are expected to put up with some controversy in a free and democratic society.” In other words, someone being offended is not sufficient reason for the ads to be pulled down. It must contravene some aspect of the law for it to be pulled down on legal grounds alone. This raises the real question: Who exactly is unhappy and constantly complaining about western, including Canadian laws? Judging from the content found on most anti-Islam blog sites today, it would appear that it is the Islamophobes, more than any Muslim, who want to change the laws of Canada (or America, or U.K., or France) for them to better fit their vision of an ideal western society. It is certainly the Islamophobes who are the most verbal and adamant in such demands or implied demands. Rather than backing down, apologizing, and providing all sorts of justifications and defences, Canadian Muslims and their leaders ought to go on the offensive and challenge Michael Coren and his ilk to bring his argument and case to the Supreme Court, if he really loves his (adopted) home of Canada as much as he claims and if he really does believe that such ads threaten Canada. The reason Coren and no one else will do this—and I can guarantee this – is because this is a non-issue and it stands no argument on legal grounds. The Muslim-haters know this very well. Typically, what such pseudo-news programs are reporting is not any type of legal “controversy” at all, but rather an attempt to create sectarian conflict and controversy where it need not exist. The matter of the choice of the Arabic word “Allah” instead of the English word “God” in the Muslim ad, and its wisdom or lack thereof, can be a topic of discussion elsewhere. For the purposes of the argument in this article, however, it should be understood that even if “Allah” referred to a non-Judeo-Christian or false god, the ad still has a right to be put up under both Canadian law as well as TTC guidelines and regulations. The ad could have been in support for the ancient Greek god Zeus, and it would still be legal. The Toronto Sun and their flock of sheep would not need to ask such questions if they (and other Canadian newspapers) did their job when reporting about Islam and Muslims and actually investigated the facts. The other alternative, of course, is that they have investigated the facts and are perfectly aware of what they are mis-reporting, but they are purposely presenting selective and slanted bits of information that will prejudice the majority of Canadians against Islam and Muslims. Yes, this does sound like one of those extremist conspiracy theories. Until you actually do bother to check out the facts. Now in all fairness, newspapers like the Toronto Star (and even the Sun) did mention another ad—this time a Christian one—that was also raising the ire of some TTC riders. The ad in question was put up by Bus Stop Bible Studies, a Christian Canadian organization that has been placing religious ads on TTC buses and trains for the past five years. Had a small group of Muslims not joined them in similar activity, there is of course a good chance that this group could have carried on their work for another 100 years without any newspaper ever taking any interest or note of it. Unfortunately for this Christian group, however, they too now have to face a tiny portion of the criticism that is otherwise being projected mainly at the Muslim group. As a side-note, the specific Christian ad that raised objections was one in which a photo of a young girl is shown and she is urged to pray to Jesus for help in response to the abusive domestic circumstances in which she lives. It was not a message of religious exclusivism or one which specifically targeted non-Christians in any way, and hence it is unlikely that it was a Muslim who complained about this ad. The complaint to the TTC, as far as we can tell, was not based on any religious grounds per se but rather on other social and ethical reasons of objection. Also, in fairness, the Toronto Star mentioned the fact that, in 2009, the TTC approved an ad by an atheist group which read “There is no god”. This would make it appear that Coren, the Sun Media, and company do not have a great problem with the statement “There is no god”, but rather the part that says “except Allah”. In other words, it is not the negative statement that no god exists which is so overwhelmingly offensive, but rather the statement that Allah positively does. Had the Sun and Coren truly been concerned for the sensitivities of people of all faiths, they would object much more adamantly to the atheist ad which stated that no god (whether Jesus, whether Allah, or whether someone/something else) exists. Then again, had the Sun or Coren truly been concerned for the sensitivities and feelings of people of all faiths, they would not have approved and aired a news program which was entitled “Allah rides the TTC.” The Islamic ad on the TTC, afterall, did not make any derogatory statements about any specific god or religion. In fact, the Christian is still free to argue for the position that Jesus is “Allah”, a word which of course means “God” in Arabic and is found in all Arabic versions of the New Testament. If Coren still has difficulty in overcoming this particular cultural stumbling block, he could perhaps enlist the help of Christian Arab friends, assuming that he has any friends outside of his own Jewish-Catholic circle (Tarek Fatah does not count). And if he does, then he should certainly ask one of his Coptic Christian friends what he/she thinks of the wording, “Allah rides the TTC.” For some reason, this particular wording did not at all offend Tarek Fatah and his friends at the Muslim Canadian Congress (widely regarded as a puppet organization), but it may very well offend Arab Christians who also pray to “Allah” everyday. If we are not careful, Michael Coren (author of the book with the exclusive truth-claim title of “Why Catholics Are Right”) will eventually have the world believing that Canadian Muslims stand guard outside the doors of Roman Catholic churches in Quebec on Sunday mornings, preventing anyone from under the age of 60 from attending Sunday Mass. The decline of Christianity and “Christian heritage” in western Europe and in Canada, after all, can only be blamed on the presence of Islam and Muslims! A convenient and symptomatic scapegoat for much larger problems, and a grand conspiracy theory if we ever heard one! Let us address this final argument, the argument of exclusivist claims in the forms of religious ads in public spaces by Muslims. We will now share a small sample of the over 300 ads that can be found at the website of Bus Stop Bible Studies and which are available to be sponsored for TTC buses and trains. We draw your attention particularly to the ads which quote John 14:6-7. These particular selections, which state that there is no way to God EXCEPT THROUGH JESUS, have already been approved and have appeared on TTC buses and subway trains, according to David Harrison, the President of Bus Stop Bible Studies (one of these John 14:7 panels, quite interestingly, features a photo of a very young Muslim girl in a hijab). His organization currently has over 500 panels on TTC buses and trains, including 220 “studies”; the Walk-In Islamic Infocenter, the group at the center of the Sun’s ire, has only 10 posters that are found in 7 different TTC locations. Talk about the need to contextualize the news! Below is a selection of Bus Stop Bible Studies that can be sponsored to be put on TTC buses and trains, including selections from John 14:6-7 which are currently already running on TTC buses or stations according to Mr. David Harrison. Let the haters now stop with this imagined persecution mind-set. Had Muslims run ads similar to the ones below, we all know that Sun Media would have had a field day with it. In light of the fact of these ads, if there is anyone being discriminated against, it is clearly the Muslims. If there is anyone receiving special privileges, it is probably the Christians. That is why the Christian ads below have been running in the hundreds on TTC buses/trains for the past five years, without a whisper from the media. Yet when a small group of Muslims decided to exercise their rights also and partake in similar activity by putting up a handful of ads of their own, they were immediately hounded by the right wing Sun Media. Yes, there is a double standard at work. Except for the most hardened and wilfully blind of people, seeing is believing. Let us open our eyes and see. The two panels below are making exclusive claims to the Truth. The ad below could be offensive not only to non-Christians, but also to Christians who do not believe in the need for water baptism. By default, the panel below is saying that anyone who does not believe in Jesus as the Son of God will perish. In the panel below, other religions are basically negated by being criticized for having the wrong approach to God. The ad below is potentially offensive to anyone who values a post-secondary education! The panel below could be offensive to the families of the female victims of Ted Bundy, as well as to other women who have been the victims of violence at the hands of men. The ad below could be offensive to non-Christians. If Jesus Christ is “Lord”, this implies that the gods of other religions are false. It is an exclusivist claim. The ad below could be offensive to people who are rich (if they bother to ride on public transit). The ad below is a clear and derogatory negation of idol-worship, and hence could be offensive to Hindus and Buddhists. The panel below could be offensive to orthodox Jews who participate in public congregational prayers in synagogues (notice how the panel has interpolated the words “or churches” in square brackets, something not found in the original biblical passage being quoted). The ad below makes it clear that all non-Christian religions are meaningless. The ad below states that there is no way to the Father (God) except through Jesus. The panel below is currently advertised at a TTC bus/train/station. The panel below is currently advertised at a TTC bus/train/station. It features a photo of a young Muslim girl in a hijab and the biblical passage that states that no one can come to God except through Jesus. We are not aware of any Muslim complaints in regards to this ad. How do you know that the girl in the hijab is a Muslim? As my article stated, “Except for the most hardened and wilfully blind, seeing is believing. Let us open our eyes and see.” If you want to believe that there is some other reason that the Christian advertisers put a Middle Eastern looking girl in a hijab, fine. By the way, how do you know that it is a girl, and not a man? If you cannot see a Muslim girl in that ad, then I cannot help you, only God can. If you believe that there is some other reason that the Christian advertiser may have put an atheist or a Jewish girl in a Muslim hijab, go right ahead. I suppose we don’t know if it’s a girl either. How do you know it’s not a man? By the way, the girl in the hijab may obviously be anything in real life. If what you mean is, the model in that photograph may be non-Muslim, well then, yes, you’re right. But the fact that she is meant to be portraying a Muslim female is pretty obvious to anyone who wants to open their eyes and be reasonable. Qwerty, you got punked man! They’d better make the best of it. After sharia arrives you won’t see any placards like those any more. Islam can’t stand a level playing field. madmanna: If “Sharia arrives”, that will mean that Christianity lost on the level-playing field that the secular state gave them. I wasn’t trying to be a prophet. If Christianity loses to Islam on a level playing field so be it. We all know how much the Christians liked to ‘level’ the playing field: A little Crusading here, a little colonising here, a bit of Inquisitioning now and again. All above board of course! I know some Muslims who love dogs.Obviously, some Muslims do not believe there is a reioiglus basis to the traditional repugnance of Muslims for dogs. However, there is a large percentage of Muslims who not only believe their religion does not tolerate dogs, but who act on the assumption that they can behave as they please in a job. The Canadians have allowed enough Muslims to immigrate, that they now are a public pressure group to oppose any action against anyone claiming to act out of Islamic reioiglus motivation. Canada is a semi-socialist economy, with public control over taxi companies, so naturally taxi companies will take no action against Muslim drivers claiming a reioiglus exemption.Michael Coren is a courageous voice, far more open than any mainstream broadcaster in the US. He and others like him may yet succeed in bringing the issue to a head, and confronting the danger of Islam directly.